This is becoming a reoccurring theme: it snowed last night. It fell fast and hard. The fast part was mostly due to the strong winds which created havoc in Hayden Valley. Numerous employees in the Park need to cross through Hayden Valley to reach destinations such as Fishing Bridge, Lake and Grant but yesterday proved once again that Hayden Valley can be a no-man's land where everything goes and anything can happen. When the wind blows through Hayden Valley huge drifts are formed, such as Grizzly Drift, and snowbanks spread snow onto the road creating huge finger drifts or completely covering the road. With the relative warmth yesterday and the strong winds part of a drift collapsed onto the road and in other areas the snow had turned into slush. Equipment was brought in to clear it away but it caused a caravaning group of RV's, as well as numerous other vehicles, to wait up to 2 1/2 hours so that they could drive through Hayden. With deteriorating weather conditions Hayden Valley was eventually closed to Admin Travel late in the afternoon with near 0% viability. The wind blew hard most of the day but it wasn't until late afternoon that the snow started and it was near blizzard conditions for a short while outside. If there was any measurable amount of snow that fell it was blown away and only a dusting is actually on the sidewalk outside. And in that snow this morning are a fine pair of fox prints walking up and under the overhang and to the front door. Yesterday was a beautiful day, mostly sunny but there was still a nip to the air. No snow fell except for the snow blowing off of the trees when the wind whipped through. The day was filled with the hustle and bustle of moving boxes and stocking shelves. With the sun shining there was a little extra bounce in our steps and the occasional happy humming. The glossing over of our eyes was replaced with a bright twinkle. I was not even 1/4 mile into my journey from Mammoth to Canyon this morning when I saw a bear taking its morning stroll about 1 1/4 miles up the road from Mammoth. I was so pleasantly surprised I neglected to get my camera. I just looked out my window and saw this coal black bear and I said to myself: "Wow, a bear!" and I drove on. It appears that it is going to be another sunny day today, and taking into consideration that I saw my first bear for 2011 I think I'm heading toward another great day. Having survived the bitter Saturday morning and the gorgeous Sunday day we were greeted with yet more snow Monday which continued into today. Yesterday I drove my evening drive to Mammoth in snow and slush and with limited visibility across Swan Lake Flat. Coming down into Mammoth I found a near snowless landscape though it had snowed most of they day there. I needed to run an errand in Gardiner so I kept on going and that is when I saw it........my first bouncing baby bison of the year. It was walking behind its mother through a slight drizzle on the Chinese Garden. It was a beautiful red baby that was just a day or two old. After seeing so many sad and starving beasts lately it was made me feel so warm to see this new life. I saw Andrea and Judy at the Two Bit for their regular Margarita Monday meeting. It was nice to visit with my two good friends. Then I headed back to Mammoth in rain which turned into snow. And once again my windshield wipers went haywire and they ended up knotted together on my windshield. I pried them apart and ended up with one ripping off. Patrick to the rescue this morning when he voluntarily took one off his vehicle and put it on mine. And then I headed back to Canyon in the snow. I met a few plows on the road and eventually caught up to one and followed it into Canyon. It wasn't long after I crossed between Norris and Canyon that the road was closed behind me. It was closed for a few hours but eventually opened to visitors later in the morning. Though the snow had been plowed from the road and it was mostly clear the snow came down hard for most of the day making driving difficult. Thus we were surprised when a large coach bus full of visitors arrived at the store. The snow was causing great difficulty for one vehicle. It had become stuck in the snow behind the store so I made a call for the rangers to come help them. Later a young man came into the store requesting help because he had just hitchhiked to the store from South Rim Drive when the group he was with had dropped their car keys in the snow and couldn't find them. So I once again called the rangers. It was later that I learned that it was the same group that had been stuck behind the store. I must also mention that Bill Berg, founder of CoolWorks, stopped at the Adventure Store this weekend and left me a couple items (Thanks, Bill!). CoolWorks is the website that I originally went to over 2 years ago and applied to work at Yellowstone General Stores. CoolWorks was how my Yellowstone adventure began. It is a website with a wealth of information on how to find "Jobs in Great Places". Not only Yellowstone but all over the world. I have a link to CoolWorks so that you can check out all the job possibilities that are waiting for you. Thanks Bill for doing such a great job! I took this picture yesterday and it will give you an idea of how much snow we still have at Canyon Village. Ranger Pat and Ranger Dave stopped in the store yesterday to introduce themselves. We had a discussion about the ravens and how much I would like a sign reminding visitors that they are not to be fed. 2 hours later this sign appeared. Thanks! This morning was a chilling -5 degrees at Canyon. I had not made it to see the falls since last summer so this morning I bundled up and went to see them at 7:00. In the past couple of weeks I have been able to hear their roar outside of the store so I knew I was going to see something spectacular. I was not disappointed. With it being so cold there was copious amounts of steam rising from the falls and the yellow of the canyon was accented by the bright white snow. I would have waited a while longer for the sun to really hit the canyon for a better picture but I was just too cold to wait. This morning was the day for the Adventure Store ranger talk. At 8:00 we waited inside the store for Ranger Chris to arrive when around the corner came this bison. He looked toward the store then slowly ambled up to the door. He took time to sniff our wooden bear out front while we took pictures through the glass windows. The bison is terribly thin and I wonder if he is the same one that I saw a few weeks ago on the road. If it is he surely has lasted longer than I had expected. I don't know what he has been eating these past few weeks to sustain himself, or maybe he has just survived on any remaining fat and tissues that he had in his body. From the looks of him now there isn't much left. We had only been open a couple days when I got a visit from blog readers Larry and Peg. I had met Larry last year when I was at Grant and now he was here with his wife for a spring visit. Thanks for stopping in! I have seen very few of the Yellowstone wildlife these past couple of weeks. I did see a perfectly posed fox on a snowbank on Swan Lake Flat last week. I stopped to snap a photo but I neglected to put in my SD card! Flashback to last year when I tried to take a picture of a fox going over Sylvan Pass without my SD card. I hate that. I have been seeing the same lone bison about 1 mile south of Indian Creek for about 2 months now. He graze to the west of the road by the water. And he always seems to be in the same 2 acre area. The other morning I saw a fox wandering around in front of the store. I tried for yet another fox picture but it wandered behind a snowbank before I could snap the shutter. There are plenty of fox prints in the snow surrounding the store. In fact there are some coming up the back wooden stairs and then out across the rooftop. That would of made a great picture. The bison babies are making their appearance at Old Faithful and Mammoth. Josh took a trip to OF and came a cross a mama bison with her newborn that had just been delivered right on the road. Later he came back through a snowfall and found them in the same spot, the little bison calf laying there under a blanket of snow next to its mother. I am anxious to see my first bison calf. Snowfall has been a normal occurrence here at Canyon. It falls daily. And as I mentioned, it was -5 degrees this morning so the cold is still here, too. But with bright blue skies and a big yellow sun it is very beautiful today. The weekends weather looks great but then it is back to more snowflakes early next week. We are becoming snow weary. Canyon Village: Snow and so much more! After 330 posts you may think that I would run out of things to say. Living and working in Yellowstone is an ongoing and evolving process. No two days are alike and though I may have seen so many of the sights during these past two years I tend to look at them anew with each passing. I still notice things that I had never seen before even though my travels have taken me past those sites hundreds of times. I may know every "bear rock" between Canyon and Mammoth but sometimes I will notice that a thermal feature has puffs of steam that are only noticed in the cool mornings, or that there is a rock or tree that has an interesting shape or twist. But since day one of my voyages through the Park I have known where every single restroom is! There are just some things that are too worthwhile not to notice. Since this picture was taken last week the road between Canyon and Norris has been plowed to two lanes. It was uncertain if the road would have been open in time for last Friday's park opening but with a lot of hard work the road was plowed wider. It is unimaginable to someone who has not seen the road clearing process to totally comprehend how much time and effort goes into clearing the roads. The initial clearing can be nearly obliterated by heavy snowfalls afterward. It can be a constant battle to keep the roads clear. This morning as I came to Canyon from Mammoth I found that Blanding Hill had a couple inches of snow on it. Normally this may not be anything of concern. But this is Blanding Hill! And with the temp at 31 degrees the snow had a slight melt to it and though I started off at 40 mph going up the hill I could tell I was losing my momentum. Any pressure I put to my gas pedal would start my car sliding back and forth. After a few minutes of telling my vehicle that it could indeed make it up a slushy Blanding Hill it finally made the crest. So even a couple inches of snow can make travel through the interior a heart-pounding experience. So please drive carefully through the Park. This little coyote bounded down the road in front of my vehicle south of Swan Lake Flats. He ran and ran and ran until he finally decided to make a quick exit and jump over the snow. A tired and exhausted bison who decided to lay in the road by the Madison River. Us at the Adventure Store spent the entire week preparing the store for the opening of the Park last Friday. What a great feeling it was to have the guests coming into the store with the excitement of visiting Yellowstone. There was a lot of happy faces (both employee and guest), fun conversations and stories of wildlife sightings. And a couple of Adventure Store employees had their own wildlife sightings. Last Thursday Aaron saw a huge grizzly between Uncle Tom's Trail and Artist Point while Nancy and Jerry saw one last Wednesday afternoon across from Mud Volcano. The rest of us have yet to see one but are in great anticipation of our first grizzly viewings for 2011. We are also all feeling a little more at home now. We finally have Internet access ( I wasn't able to check my e-mail for 11 days), but that sometimes is unavailable during snowy days. And after checking my e-mail I should send out a big Yellowstone Hello to Jerry, Dave and Debra!! Thanks for contacting me! Unfortunately our cell phone connections have been giving us problems. I can sometimes catch a bar on my phone if I stand on a bench in front of the store and hold my phone over my head. Obviously this something I am only willing to do before or after the store closes. And since our phones are constantly searching for a signal we all seem to drain our batteries in a day. I guess that is all a minor inconvenience when you consider where we live. We are the 9 (Nancy, Jerry, Josh, Lee, Aaron, Kem, Becky, Jim, and myself) luckiest people who get to experience the snows of winter/spring and the sun of summer in Canyon Village at the Adventure Store in Yellowstone National Park. Enough said. Yet, another post without pictures. I tried to upload one picture and with the snail pace that it was uploading I hit the X in the corner and decided to update you without the snowy picture of the Canyon Village sign. Setting up a store to open for the summer season can be everything from fun to stressful. This week has been a combination of both. Us at the Adventure Store have had to deal with everything from snow storms, nearby gas leaks, and emergency 911 calls. Living behind those locked gates and in the interior, even for a few days, can be a lonely experience. We have not tv for entertainment, no internet connections and very spotty and limited cell phone reception. And with an emergency, as we had yesterday, paramedics and ambulances can be miles away. Our emergency ended positively but it is a reminder that we are very isolated from what most would consider civilization. Kudos to those dedicated NPS workers who work very hard to ensure the safety of the employees who are currently working in the interior!!!!! When in the interior you should always expect the unexpected. The Park will open this Friday, April 15 with limited access. Hayden Valley, south of Canyon, will not be accessible for a couple more weeks, as well as some other areas of the Park. An incredible amount of time has been spent on getting the Adventure Store open for Friday. Groceries have been ordered and are currently being delivered, gifts and apparel are also being delivered as well as outdoor rec. items. Staff is being trained, housed and fed. Paperwork being filled out, recyclable items and transfers being hauled away to their appropriate locations while numerous people design and stock items. There are so many people, NPS and concessionaire employees, involved in making your Yellowstone adventure as perfect as it possibly can be. I had some nice pictures to share but unfortunately they will not upload. I don't seem to get as frustrated with that as much anymore. I just shrug it off as one-of-those-things. Yellowstone is not necessarily technologically conducive to doing those tasks that rely on connections, uploading, downloading and receiving. I headed to Canyon Friday afternoon with only half of the new employees. Because of the winter storm and road conditions I had to leave Nancy and Jerry in West Yellowstone with their RV. Blanding Hill, between Norris and Canyon, can be a bear during snowy conditions and I had concerns that they would not make it to Canyon. They unhooked their vehicle and drove that in today. It was a good thing because the road between Norris and Canyon has snow towering above the vehicles on both sides of the road and the road is only 1 1/2 lanes wide which can be a nightmare if you come across a plow coming from the opposite direction. So Nancy, Gerry and their cat, Shadow, are living in the dorms at the Adventure Store until they can bring their RV in. Our new maintenance guy, Jim, is staying in his RV in West Yellowstone until he too can move his RV to Canyon. The snow levels at Canyon are unbelievable! Today I met 3 of the men who were shoveling the roof of Canyon General when they came out to inspect how much snow had fallen since last week. It is a small world, when I was visiting with one of them I found out he was originally from Fargo, North Dakota (80 miles from where I am originally from) and we went to the same university (University of Minnesota, Moorhead). I also ran into Ranger Chris who informed me of a propane leak in the Canyon area but at this time those of us at the Adventure Store are not close enough to be evacuated. I got to know Ranger Chris during these past two winters in Mammoth and I am so happy that he will be a law enforcement ranger at Canyon. I have 4 members of the 2011 Adventure Store staff at the store now, 2 more will come in on Monday. When a new group of people get together it is always hoped that they will be a group that meshes. And what can I say about this new group?! The word: WOW comes to mind. I can already tell that it is going to be a fabulous year with top-notch Associates and Floor Supervisors. There is an incredible group at the Adventure Store just waiting to get going and start our season. I sat outside the store this afternoon at the picnic tables under the overhang. I heard the most incredible sound ever: silence. It is odd to not hear the roar of the waterfall, the sound of laughter from visitors, the sound of cars driving by or the sound of anything. It was the most silent silence I have ever heard. Then occasionally I would hear a small drip of snow melting off the roof and hitting the pile of snow underneath. And then I heard the sound of a raven flying by. And that was it. Silence. And with our latest dumping of snow I have to mention a conversation I had at the Food Farm in Gardiner with a kindly gentleman this morning. We were moaning and complaining about this last storm and how much of a hassle it is to move around and get things accomplished with the 8 - 12 inch snowfall that fell on top of all the previous feet of snow we have had. I know that I let out a few choice words this morning as I waded through snow brushing snow and scraping ice off my vehicle and then having to listen to the thud, thud, thud of snow in my wheel well as I drove. This gentleman put it all in perspective when he mentioned that no matter how difficult this new snowfall is on all of us, physically and emotionally, it could never compare to the heartache that has been going on in Japan. And suddenly my urge to complain disappeared. The possible government shutdown has been a regular topic in the Park lately. There has been lots of worries, rumors, and confusion on what will exactly happen. With time ticking away we seem to be heading closer to the Park being shutdown. The television crews from neighboring towns were in the Park yesterday filming and interviewing people on how a government shutdown would affect them. The store was also a location that these film crews came to. I was asked to do an on camera interview but I declined. The crew was given permission to film the inside of the store. I decided to turn the camera on the crew and take a picture of them. Snow has been piling up in the interior these past few days, and more is expected.....quite a bit more. I am to head to Canyon this morning as long as there is admin travel. 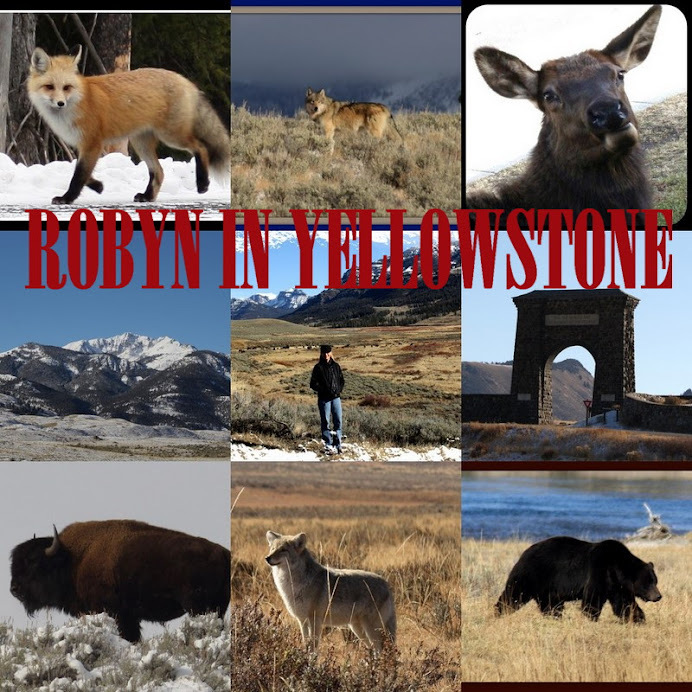 I need to be in West Yellowstone tomorrow morning by 10:00 and depending on the snow levels and admin travel tomorrow I will be either traveling through the Park or driving all the way around (to Bozeman and down --- a 4 hour drive). Snow and a possible government shutdown are complicating matters here. Technological gremlins raise their heads once again. I am unable to upload any pictures so my narrative must suffice for now. Last year we were doing Snow Dances trying to conjure up snowflakes but this year we are trying to stop those flakes. It keeps snowing and blowing and the clouds keep hiding the sun. Looking back I can't think of a day when there was a full day of complete sunshine since October. Friday it started off gloomy but as the day wore on I found the sun shining down on my way back of from a trip to Bozeman. The temps actually hit 63 degrees in the valley, but since I was in a car I could only enjoy the sunshine through my windshield. Saturday Patrick needed to transfer a pickup back to Lake so I hauled a load of boxes in my vehicle behind him. I only saw three bison on our way to Lake, one being in Willow Park, possibly the same bison I have seen there for the past two weeks. When we got to Lake we settled in the apartment to have lunch before our trip back to Mammoth when the electricity went out. It was not totally unexpected since the wind was howling. We had a lunch of cheese and croutons and headed back to Mammoth. We stopped in Hayden Valley to look for any signs of wildlife, which we saw none except a couple bison. The wind blew so hard that it rocked my vehicle back and forth. We didn't linger long on our way back since the trees were swaying and we had already encountered a few trees that fell across the road leaving only enough room to move a vehicle around them. Today was not much different. I awoke to an inch of snow on the ground and a good coating of ice on my windshield. It periodically snowed and the wind had a mighty sting to it. It varied between a cloudy snow and the occasional party cloudy sky. We have agreed that we have become winter zombies and long for a full day of sun. Judy says that the first snowflake of winter is still somewhere laying on the ground of Mammoth. And I tend to agree. This winter has been a long winter on beast and human in Yellowstone.